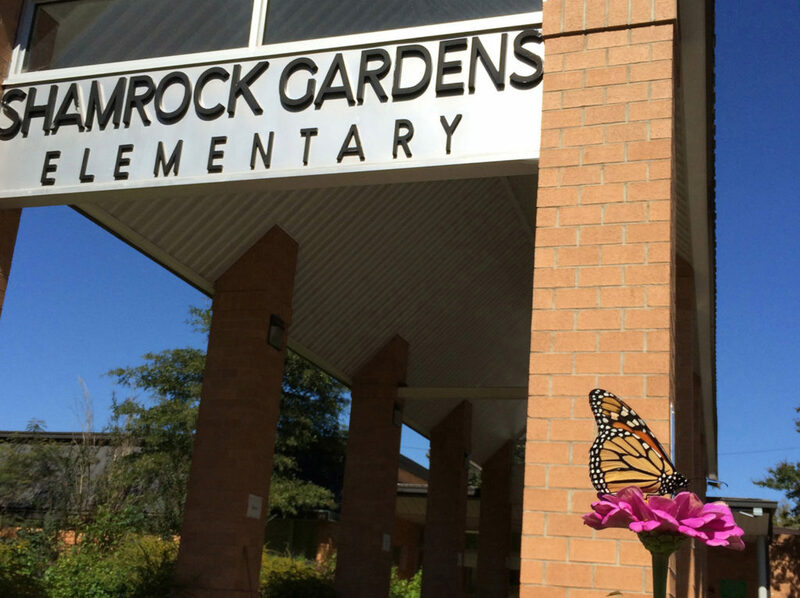 Shamrock’s garden programs are part of an ongoing effort to provide a rich and vibrant education to students from all walks of life, challenging the economic segregation that marks so many Charlotte schools and the narrow focus on standardized test scores that has done so much damage to American education. Shamrock’s beautiful Midcentury Modern building was completed in 1954. Segregation was the order of the day, and the school educated white children from recently built neighborhoods that included Country Club Heights and Plaza Shamrock. In 1971, when Charlotte desegregated its schools, Shamrock was paired with historically black Oaklawn Elementary. Students from both feeder areas attended Shamrock for grades K-3, and Oaklawn for grades 4-6. The 1980s and 1990s were tough years for the school. Many of the city’s better-off families headed for the suburbs, making it difficult to maintain racial and economic integration. Attention focused on building schools in the rapidly growing suburbs, while older schools such as Shamrock were left to deteriorate. Desegregation efforts lagged. By 1997, Shamrock had become one of the poorest, most dilapidated and lowest-performing schools in the state. Soon afterwards, however, concerted efforts on the part of the district, the school board, the Shamrock staff, and a handful of families living in nearby neighborhoods started a revival. Behind that effort lay the belief that the best way to improve struggling, high-poverty schools was to reintegrate them racially and economically. In recent years, the school has improved dramatically. Test scores have risen for every student group, the teaching staff has stabilized and activities such as the garden programs offer every student the kind of rich, varied education that all children deserve, but too many never get. Shamrock’s challenges are far from over – racial and economic reintegration raises new issues even as it helps address old ones. But we have come a long way. More about Shamrock and its history can be found in the following links. Seen from the ‘Rock – Blog written by parent and education activist Pamela Grundy that chronicles activities at Shamrock, 2009-12. • Landscape – Post on early garden experiences. • If You Build It They Will Come – Post on early butterfly experiences. • Clearing Space – Post on the start of Shamrock’s vegetable gardens. Beyond the Test Score Bump At Shamrock – UNC Charlotte researcher Amy Hawn Nelson takes a close look at Shamrock’s achievements. #OneDayTA – State Senator Jeff Jackson’s chronicle of a day in the life of Dot Futrell, Shamrock teaching assistant extraordinaire. Risk We Took Was Great Choice – Almost a decade after her son started kindergarten at Shamrock, Pamela Grundy explains what the school means to her family. The real story of how a failing North Carolina school became a success story – Article in the Washington Post’s “Answer Sheet” blog about the key roles played by building community and creating enrichment programs in school improvement.